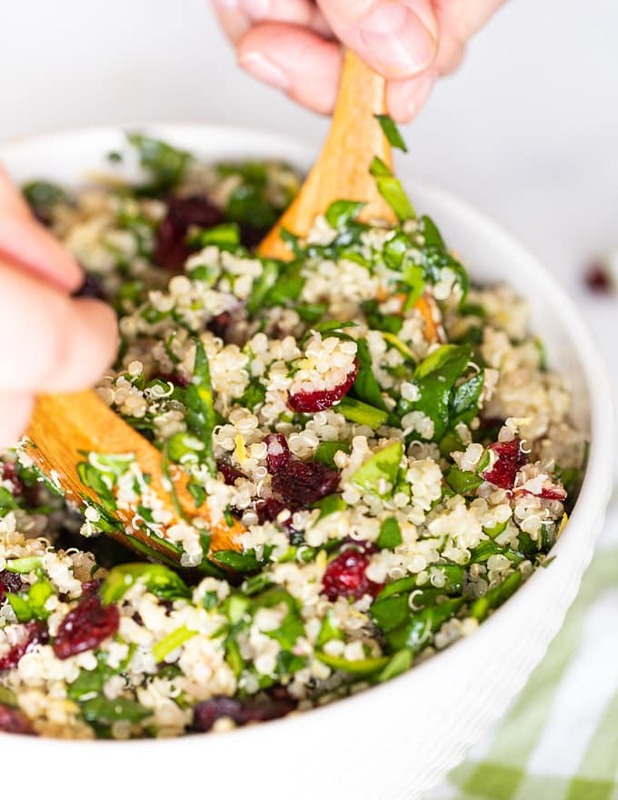 This Quinoa Cranberry Salad is full of fresh, feel good flavours that everyone will love! 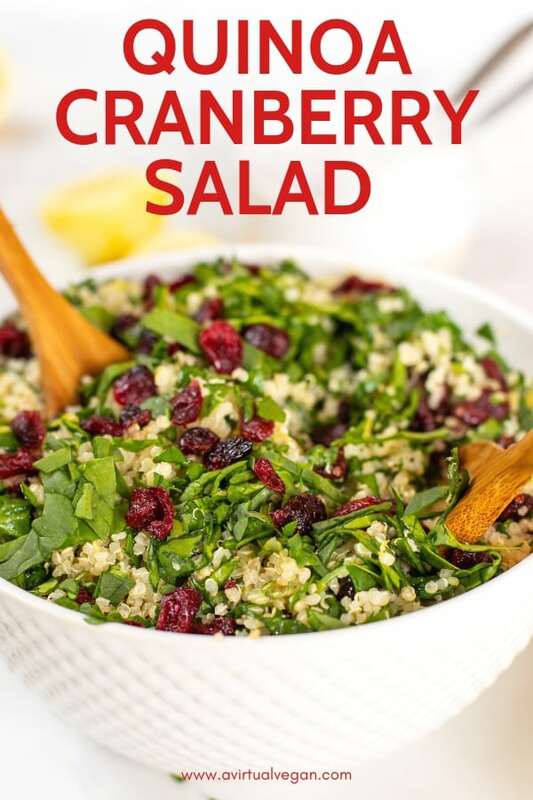 With nutrient rich spinach, sweet dried cranberries and a zippy lemon dressing, it is able to stand alone as a protein packed, healthy meal, or can be served as a side. It’s easy to make ahead of time and is naturally gluten free. 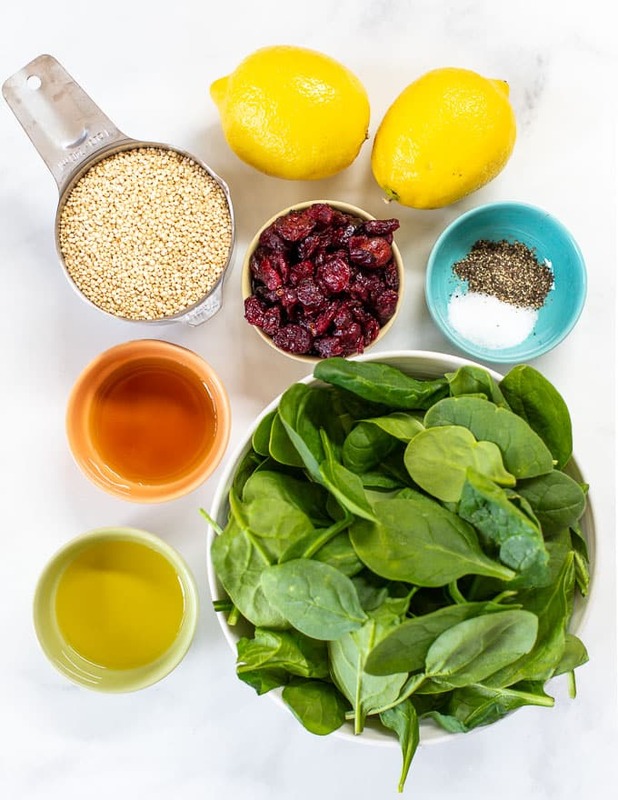 This super yum Quinoa Cranberry Salad with Lemon and Spinach is what we need to talk about. 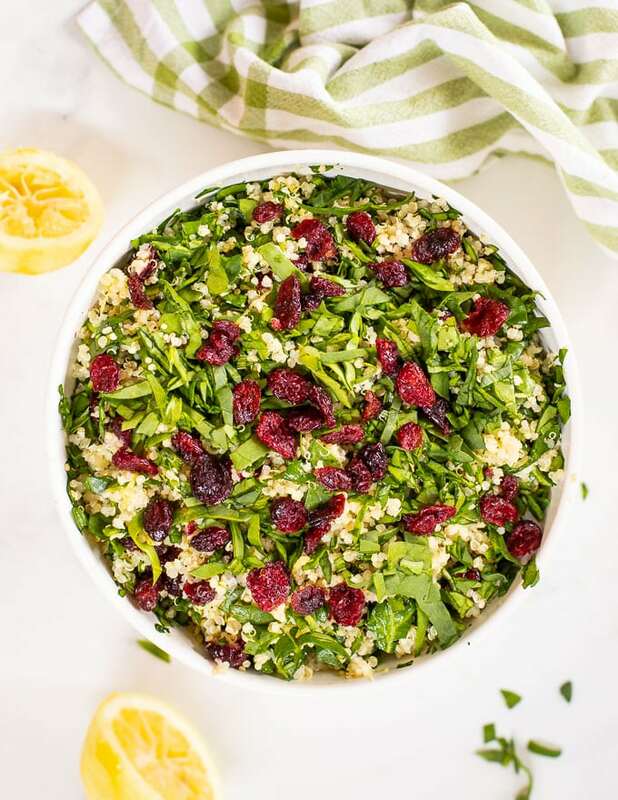 Nutty quinoa, fresh green spinach, chewy, sweet, dried cranberries and a really fresh and zippy lemon-y dressing to bring it all together in a very happy way. That’s pretty much it. Simple, hearty and so good. Although, I do like to toss through some of my crumbly Vegan Feta Cheese on occasion too. That is an optional extra. …. But also really, really good! Rule for my salads … Must. Taste. Amazing. Ain’t no boring, tasteless salads going down here and this one is no exception. Bathe that quinoa in zingy lemon dressing and holy moly it’s good. It’s citrusy, grainy and totally satisfying. 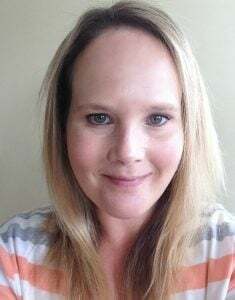 It’s also the perfect salad to make ahead for picnics or potlucks, to accompany whatever you are cooking on the grill, or for an easy lunch option that you can eat at work to stay healthy. Anytime you are craving a healthy and zesty quinoa salad, this is your friend. When making a quinoa salad it’s important to cook the quinoa and allow it to cool completely before you start. I find it easiest to cook the quinoa the day before I actually want to make the salad or to make extra for another meal and save the leftovers. 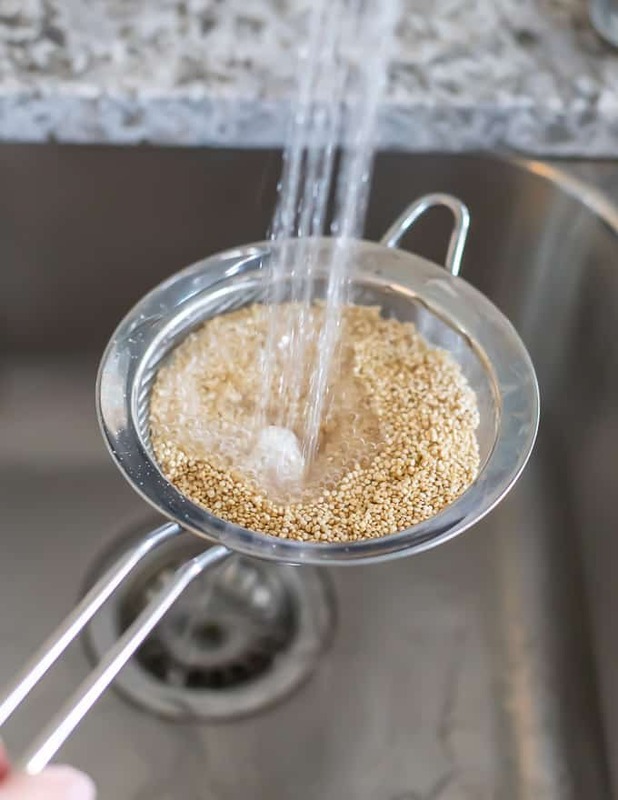 No matter which method you use to cook your quinoa, it is important to rinse it well in a sieve. Then sauté the raw, wet quinoa in in a dry pan / or in your Instant Pot, for a few minutes, stirring constantly until it smells nutty, then turn off the heat. My favourite way to cook quinoa is in my Instant Pot. 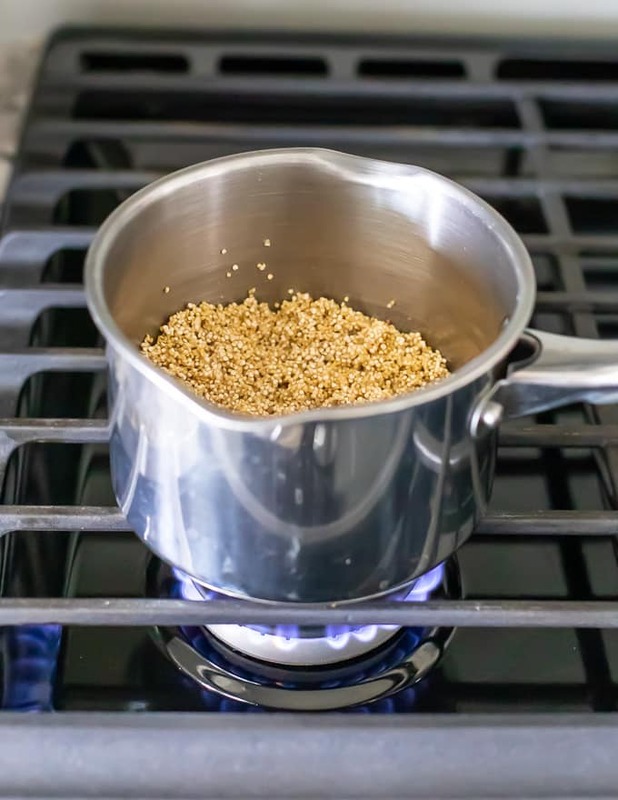 Once the quinoa has been rinsed and toasted, cover it in the same volume of water or broth/stock as there is quinoa, so for every 1 cup of raw quinoa you need 1 cup of water. Add salt if you want to, stir, then put the lid on and seal the vent. Set to 2 minutes high pressure and leave the pressure to naturally release. Remove the lid, fluff with a fork and you have perfectly cooked quinoa! Once the quinoa has been rinsed well, transfer it to a pan and add 2 cups of water or broth/stock for every 1 cup of quinoa. Add a pinch of salt too if you want to. Now here’s where my way differs from other methods. Cook it uncovered on a medium heat for about 10-15 minutes until the water has been mostly absorbed. Then turn off the heat, cover, and leave to steam for at least 5 minutes. Fluff with a fork and you have perfectly cooked quinoa! Mix it together with cooled quinoa and a handful or two of dried cranberries. The lemony dressing is all shaken up in a jar and poured over, then everything gets tossed together. 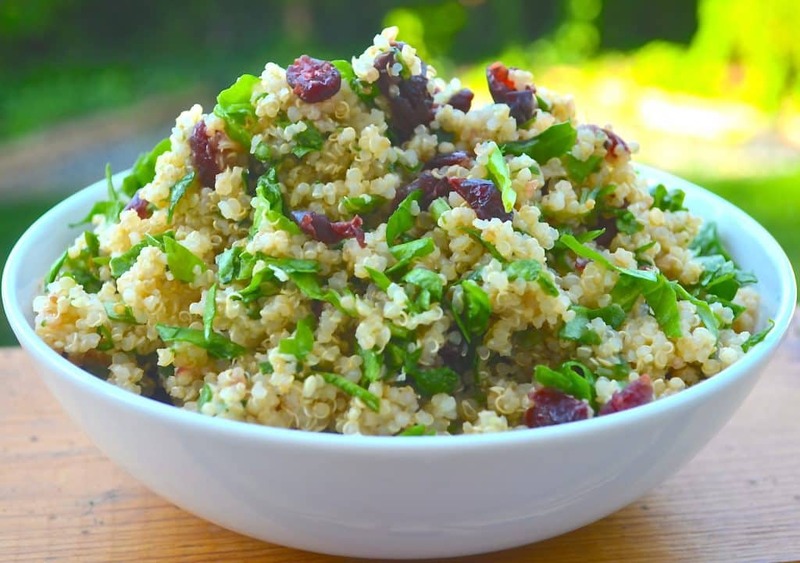 And just like that you have a Quinoa Cranberry Salad. With quinoa salads anything goes. Quinoa is a bit of a blank slate and works with all kinds of flavours, allowing you to get really creative. So feel free to use my recipe as a base and switch it up with any or all of the above! If you want to make life easy though, just follow the recipe as stated, and know that it will be just perfect. Or try my equally delicious and very portable, Peanut Crunch Salad in a Jar that also features quinoa. I know quinoa salads aren’t always top of everyone’s list, because you know … Q-U-I-N-O-A. That healthy, super food, vegan stuff. But this is quinoa salad for quinoa salad and non-quinoa salad people. It’s quinoa salad for people who quite simply, like good food that tastes really nice. Give it a try! 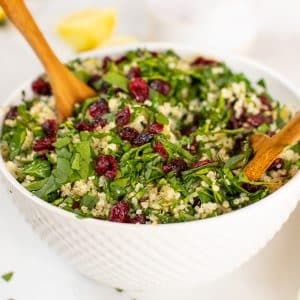 This Quinoa Cranberry Salad is full of fresh, feel good flavours that everyone will love! 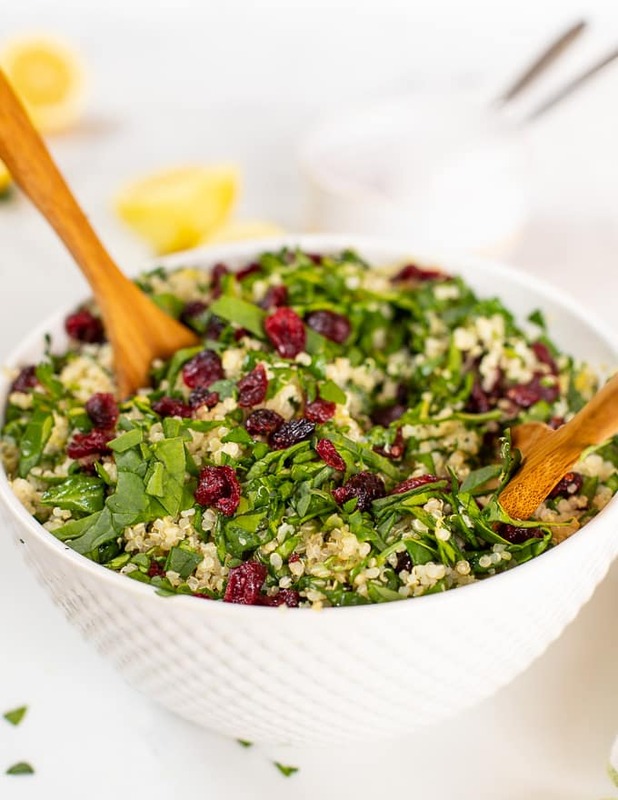 With nutrient rich spinach, sweet dried cranberries and a zippy lemon dressing, it is able to stand alone as a protein packed, healthy meal, or can be served as a side. It's easy to make ahead of time and is naturally gluten free. 1 tablespoon / 15 ml maple syrup , real maple syrup not pancake syrup. Agave can be used as an alternative. Rinse the quinoa well in a fine sieve. 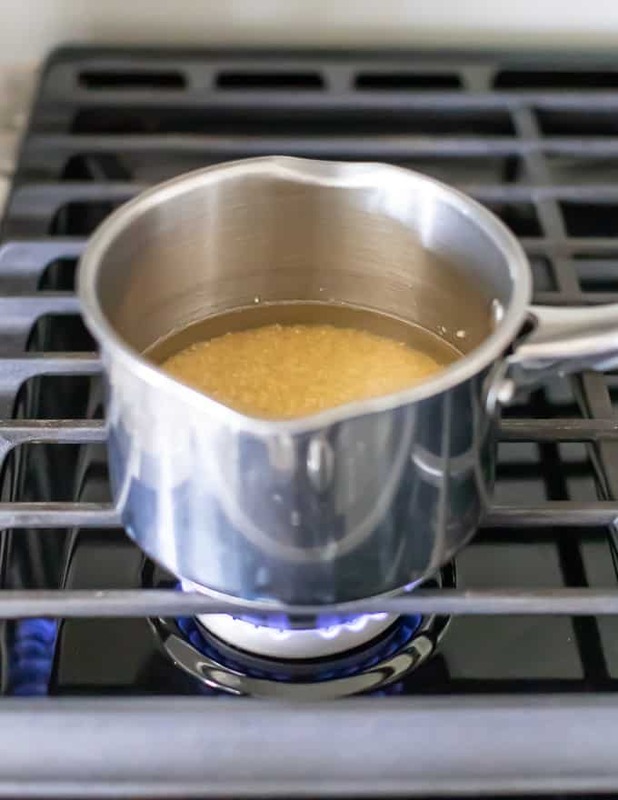 Shake out as much water as you can then gently toast it in a dry pan or in your Instant Pot, over a medium heat for a couple of minutes, keeping it moving, until it starts to smell a little nutty. If cooking on the stove top, add the water and cook uncovered for about 10 minutes until the water has mostly absorbed. Then turn off the heat, cover tightly and leave to steam for at least 5 minutes. 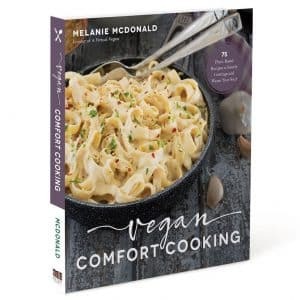 Allow to cool completely before continuing with the recipe. If you are in a hurry to cool it, you can spread it out in a thin layer on a cool plate or baking sheet. That will help it cool more quickly. 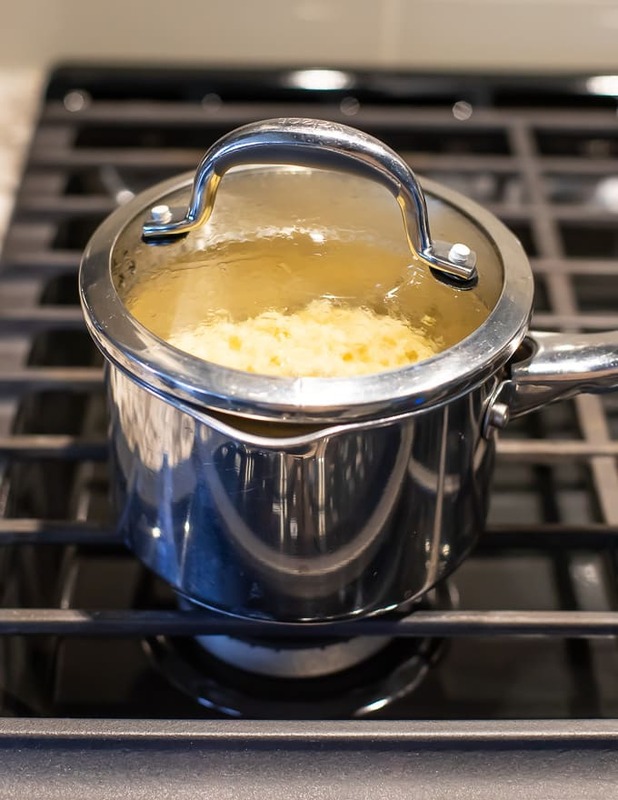 If cooking in an Instant Pot, after toasting, pour in 1 cup of water, put on the lid, seal it, and cook on high pressure for 2 minutes, then leave the pressure to release naturally. Allow to cool completely before continuing with the recipe. Shred the spinach and stir it through the cooled quinoa. Add the cranberries and stir them through too. Zest the lemons and add it to a small jar or bowl. Juice the lemons and add the juice to the jar/bowl with the zest. Add the maple syrup, optional olive oil, salt and pepper. Put the lid on and shake it or whisk it together. Pour over the quinoa mixture and toss well to coat. Taste and add more salt and pepper if needed. Store covered in the fridge. Keeps well for 2 to 3 days. 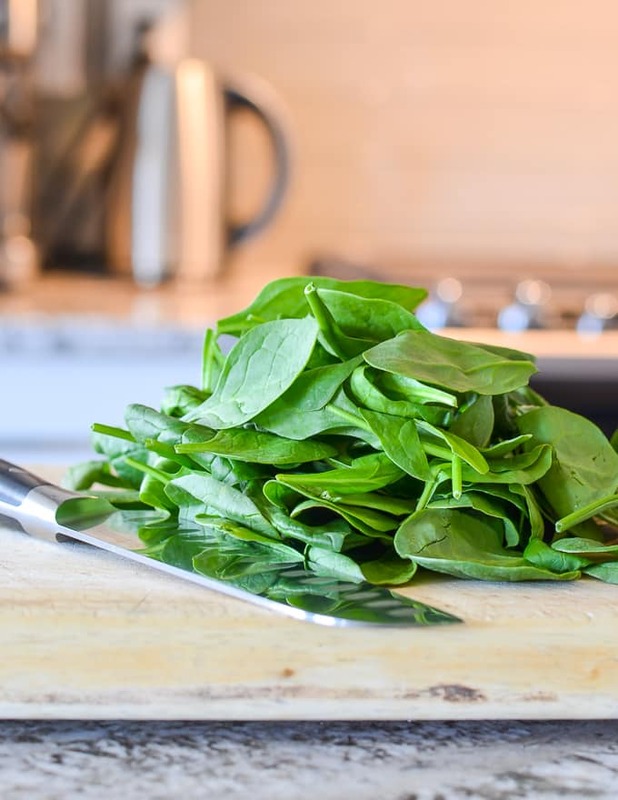 You can extend its life by another 3 - 4 days if you make the salad as directed but don't add the spinach. Shred it and add it in just before serving instead. 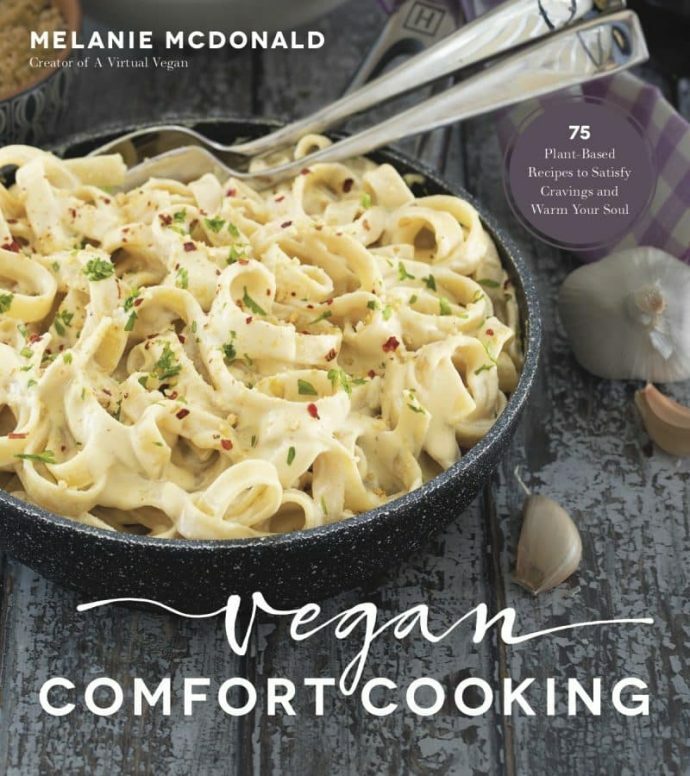 This also works well if the weather is really hot and you are taking it to a pot luck or BBQ. Take the spinach with you and shred it and add it to the dressed quinoa when you arrive, so that the leaves stay nice and fresh and vibrant. The old image from 2015 (before I updated the recipe). I’m going to make it this week with fresh fruit and nuts..
Really delicious and easy. We have made it twice in the last week! Thank you Maureen. I’m really pleased you enjoyed it! I’m a brazilian student and I tried this salad for dinner with my home family in Canada. The taste is delicious. We even tried it a second time with Kale and spinach mixed. Yum. I made a ton of quinoa (on accident) and needed something to do with it. This was perfect. It is really lovely. The flavours are so fresh. You sound like me..I always end up cooking far too much quinoa, couscous or rice!